In America, we usually don’t talk much about the Middle Class — we just assume that most everyone is in it. Except for a surprising number of billionaires, there isn’t much difference between being middle class or being wealthy, and most people simply described themselves as being middle class without giving it much thought. Historically, 85 to 90 percent of Americans have self-identified as middle class. Sixty percent is more usual today. But reaching the middle class is not just a class designation. Nor is it a matter of money. A family of five in Burundi, living on $324 a year would qualify, according to Gapminder foundation, as would a family of five in China who were clearing $121,000 annually. As a life experience, reaching the middle class is transformative. The quality of life between poverty and middle-class is stark. Anna Rosling Rönnlund, the founder of Gapminder’s Dollar Street project, said perhaps the most telling sign of people reaching the middle class is the presence of store-purchased hygienic items. From a global pespective, living in the middle class means having some luxury items most Americans think are basic essentials. Things like access to transportation, air conditioning, electricity in their homes and running water. What hasn’t been much noticed is that worldwide, poverty is declining and more people are joining the middle class. We have better data on global poverty from the World Bank. Global extreme poverty has declined from 44% to less than 10%. This is a very big deal indeed. The decline in world poverty has occurred during the Pax Americana, a period notable for the relative peace that began with the Marshall Plan to rebuild a destroyed Europe, the defeat of socialism and a huge expansion of freedom and trade and connectivity. And then there was our great Norman Borlaug, father of the “Green Revolution” in agriculture in third-world countries, who saved a billion people from starvation. He remains better known in India, Pakistan, Mexico and China than he is here. With his pioneering techniques, grain production jumped from 692 million tons in 1950 to 1.9 billion tons in 1992. A slight rise in atmospheric CO² (a natural fertilizer for plants) has meant better plant growth all over the world, and fewer people going hungry. The ability to genetically modify food crops to use less water, or to resist noxious pests, or in the case of “golden rice” to add a gene for the production of carotene. In many ares of Asia, vitamin A is devastatingly rare in the diet of children causing blindness and altered immunity. Rice is the dietary staple, adding it to rice can save children’s lives and vision. The tinfoil-hat crowd does not understand that genetically modifying a food crop to resist drought, or in this case to produce carotene, is perfectly safe. They could more profitably turn their attention to the folks that are trying to bring back the woolly mammoth (in Russia) or bring back some kinds of dinosaur. That might be something to worry about. For most Americans, becoming a member of the Middle Class is sort of expected, at least when the economy is performing as it is supposed to. For many people all over the world, it is only a vague idea to be dreamed of, yet day by day it is becoming reality for more and more of the world’s people. The Fuego volcano in Guatemala has erupted today, many deaths much destruction. Here’s a link to the Twitter coverage. At least 25 people have been killed. This is apparently the second eruption this year. The mountain is close to the capitol city. This one is a must watch video. Prager University is doing a wonderful job with their very short videos to teach short classes, and make us think. There are really important subjects out there, and we must, at our peril, pay attention, and give the matter real thought. Governments can go haywire. European governments have fallen for guilt. Not just undeserved guilt, but guilt that makes no sense. So they pretend. They pretend that that the problems brought by uninvited immigrants must be ignored, so they can pretend they are being nice. It’s hard to take on difficult problems and work out ways to deal with them. It’s easier to avoid any fights and dissension. But the future is out there, waiting to be — what? You can ponder the possibilities. In the progressive project to remake humanity and civilization, nothing counts but good intentions, and the details will all be worked out by experts, using the infinite credit card. And thus we get $1 trillion or so of annual “anti-poverty” spending that never makes a dent in poverty. As hard as that one is to top, nothing can top the delusional thinking on the subject of renewable energy, particularly the idea that it will be easy and costless to transition over a few years to a world where fossil fuels have been banished, and yet we want and need. Today, from FEE (the Foundation for Economic Education) we have the encouraging headline “The World’s Poorest People are getting Richer Faster Than Anyone Else.” “The speed of poverty alleviation in the last 25 years has been historically unprecedented. Not only is the proportion of people in poverty at a record low, but in spite of adding 2 billion to the planet’s population, the overall number of people living in extreme poverty has fallen too. Do read the whole thing, I thought a little very good news might be welcome in the face of the outrage and anguish that are the daily fare of the media. No, it is not the result of the progressive project to remake humanity. It’s the result of plain old free market capitalism. Works every time. President Trump’s decision to withdraw from the Paris Climate Agreement is a devastating failure of historic proportions,” Schumer said. “Future generations will look back on President Trump’s decision as one of the worst policy moves made in the 21st century because of the huge damage to our economy, our environment and our geopolitical standing. At a news conference in Brussels in early February, 2015, Christiana Figueres, Executive Secretary of the United Nations Framework Convention on Climate Change, admitted that the goal of environmental activists is not to save the world from ecological calamity—but to destroy capitalism. Socialists, intent on the wonders of social justice and the ‘better world’ of their dreams, never, never seem to pay any attention to the monumental failures of socialism everywhere it has been tried. The past 25 years have witnessed the greatest reduction in global poverty in the history of the world. An 80 % reduction in world poverty in only 36 years. Globalization, Free markets, free trade, international entrepreneurship. The free enterprise system, American style, which is our gift to the world. This is not the first time some greenie has blurted out the truth behind their campaign to protect the world from the horrors of the carbon dioxide we exhale every time we breathe. Go figure. President Obama committed $3 billion to the Green Climate Fund, without authorization from Congress, about 30% of the $100 billion demanded from the United States to be shifted to trying to help poor nations deal with non-existent climate warming. They only got 1 billion before Obama left office and the U.S. was expected to come up with the other $2 billion promptly. According to researchers at MIT, if all nations met their targets for reducing carbon emissions, the impact on the climate at best would be likely to reduce global temperature rise by 0.2 degrees by the year 2100. That ‘s 2/10 of one degree C. Under the accord, China gets to continue building coal-fired plants and increasing emissions until 2030. 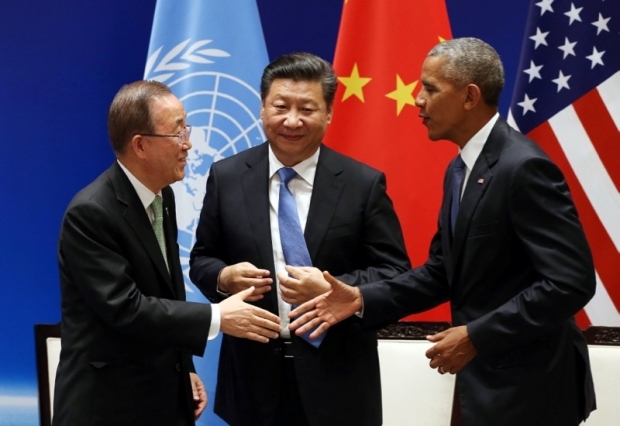 The Climate Accords were a very bad deal for everyone but China. CO2 represents only the smallest portion of atmospheric gasses. The most important atmospheric gas is water vapor — clouds. Carbon dioxide (what we exhale) is a fertilizer for plants and the slight increase has meant a greening world which has helped to feed the world’s hungry nations. The terms of the Accord required countries to update their commitments every five years to make them more ambitious, starting in 2020, leading to an eventual 80 percent cut. If everybody met their commitments, the effect on the climate would be almost undetectable. The Left is big on income redistribution, not theirs, of course, but other people’s. But as Margaret Thatcher said “Sooner or later you run out of other people’s money.” Their goal is not helping the poor— it is power. They just can’t get it through their pretty heads that socialism doesn’t work, and has never worked, everywhere it has been tried. But they are fixated on the idea of fixing annoying human nature, eliminating wars and other annoyances and in general concentrating all power in an educated elite like themselves in Washington D.C. ruling the world in perpetual wonderfulness. * That’s Christiana Figueres in the light slate blue on the left. Back at the beginning of his first term, President Obama and Secretary of State Clinton announced a foreign policy “pivot” to Asia. The road of good intentions chose another direction, and the big events continued to happen in the Middle East. Civil war in Syria, the rise of ISIS with accompanying terrorism and brutality, regime change in Egypt and Libya, and the continuing Iranian quest for nuclear weapons and regional dominance are the problems that have dominated the news and Obama’s response to those events has comprised his foreign policy record, and it is not a record that makes much of a legacy. The Mullahs in Iran really had no interest in a deal. They are interested in destroying Israel and in destroying America, and do not intend to be delayed or restrained. Obama believes that they care about their people and will use the funds returned to make life better for Iranian families. He believes he can turn the Middle East over to the Persians to run, and remove all American interference in that part of the world, which will mean peace. He apparently believes that all the problems in that part of the world are Bush’s fault for invading Iraq, and he has no interest in being disabused of his fanciful notions. You can’t build a foreign policy legacy out of trying to avoid any confrontation at all. Obama’s playing his last hand and betting on the Paris Climate Agreement and the Trans-Pacific Partnership (TPP) trade deal, by pretending they are not treaties, but some kind of deal that does not require the consent of Congress. But that has been his operating plan for some time. The Senate will not ratify the treaty. Even if all the nations who have signed actually implemented their plans, it would reduce the growth of emissions only about half as much as the claimed 3.6º Fahrenheit which some scientists claim would reduce drought, floods, and other catastrophes which are not caused by increases in temperature. The Coalition of the Least Developed Nations agreed to go along because the rich nations agreed to give them at least $100 billion, but no one has started raising any money yet anyway. The panic about climate occurs only in the computer programs of the climate scientists who depend on climate panic for their jobs, their grants, and their reputations. Obama apparently insulted the new Philippine president who then called President Obama the ‘son of a whore,’ so in general the big G-7 meeting didn’t go too well. Obama is off to Laos as the first U.S. President to visit that country. Over nine years — from 1964 to 1973 — the United States dropped more than two million tons of bombs here in Laos — more than we dropped on Germany and Japan combined during all of World War II. It made Laos, per person, the most heavily bombed country in history. As one Laotian said, the “bombs fell like rain.” Villages and entire valleys were obliterated. The ancient Plain of Jars was devastated. Countless civilians were killed. And that conflict was another reminder that, whatever the cause, whatever our intentions, war inflicts a terrible toll, especially on innocent men, women and children. Our planes were bombing the Ho Chi Minh Trail to prevent supplies coming down that trail to kill American troops from reaching Vietnam. It was a purposeful effort to save American lives, not indiscriminate and trying very hard not to kill civilians. Ask anyone who was there.